Plantain is a sturdy perennial you may notice along sidewalks and sometimes right in the middle of a dirt road or in cracks in the pavement. This plant thrives best in high impact areas, oddly enough, and in gravelly soil, Like Dandelion, all parts of the Plantain plant can be used. It lubricates, soothes, and protects internal mucous membranes; it can be used as an emollient; astringent, anti-inflammatory; and to stop bleeding. The seeds are nutritious and full of easily assimilated B vitamins, which poultry love to eat on range. Both of these natives (broad leaf and narrow leaf) are common in North America with many cousins in the family. The leaves are succulent, but also contain strong fibers. The mucilaginous and astringent qualities make it an excellent choice for reducing inflammations. Those same qualities may also be useful when treating an egg-bound hen. Plantain is best used fresh. Use a juicer or a blender and pack the herb loosely with just enough water to cover the herb. After straining the liquid it can be used externally or internally. The juice will keep for 2 weeks in the fridge. For internal use, pour some of the juice into their waterer. To use the juice externally, soak gauze in it and tape it down to the inflamed or irritated area. A skin wash made with tincture could help with external parasites and fungal infections. Plantain is a somewhat inconspicuous plant until it sends up its tall spiky seed stalks that tower about 12-18 inches over it. 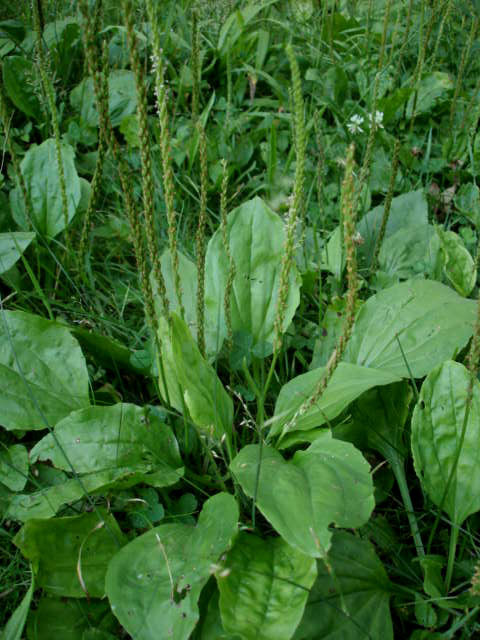 Plantain grows in USDA Zones 3 to 9, and prefers partial or full sun. Plantain is a hardy perennial, which grows from a tough rootstock. The basal rosette of large, broadly oval dark green leaves, grow long and slender leaf stalks that are uneven and toothed with densely-flowered spikes. Each tiny flower is brownish and bell-shaped.